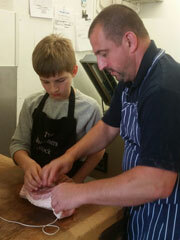 Traditionally apprentice trained age 16, Matt has been butchering ever since. 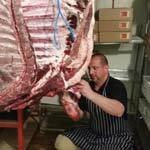 Working for large and small butchery companies and then specialising in wholesale butchery later in his career. Matthew and his partner Jessica established the shop together in 2007, Jessica having worked in retail food since the age of 16, from deli’s to a specialist cheese shop. Assistant manager Lewis apprentice trained at Thomas Danby College Leeds, qualifying 3 years ago, and now Daniel is following in the same footsteps. Matt has worked in New Zealand and in Yorkshire, over the years working in many of the small butchers shops that once filled our city, but have now sadly gone, but the tradition and skills of butchery are not to be left to die. There is a place in our high streets and shops in our city’s for the butcher and indeed now more than ever people are realising that mass produced supermarket meat is often butchered and packaged weeks before it reaches the shelves and often with such a long line of traceability, ironically it is just that tracebility which is lost. Clever packaging and advertising distract us from the price per kilo – often far more expensive than the local butcher-where the meat came direct from farm to slaughter house to the shop possibly even on the same day. Use them or lose them !! That goes for all of our small city shops. Be wise in what you buy, we strive to be competitive with supermarkets on price and more often than not beat them on price. Visit us, see for yourself. A little bit about our members of staff who are always on hand to offer expertise and help you with your order. 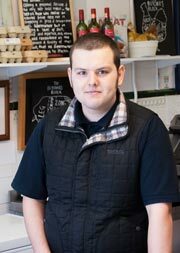 Our assistant manager Lewis has been a valued member of our team for over eight years. 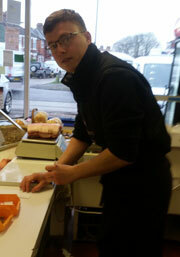 After joining us in 2008, Lewis studied his apprenticeship in butchery at Thomas Danby College. Daniel joined us as an apprentice in 2014 and is now our latest fully qualified butcher. After studying a three year course at Leeds City College, Dan completed his studies in 2017. The next generation of butchery in the family, our son Tristan enjoys helping out in the shop, and is learning the trade from his dad Matthew, with a helping hand from Lewis and Dan of course!